The design I used is based on industrial pallet-packing robots, and at its core has three degrees of freedom, or ‘axes’ on which it can move. Think left to right, in and out and up and down; it basically means that the arm can move in three different ways. 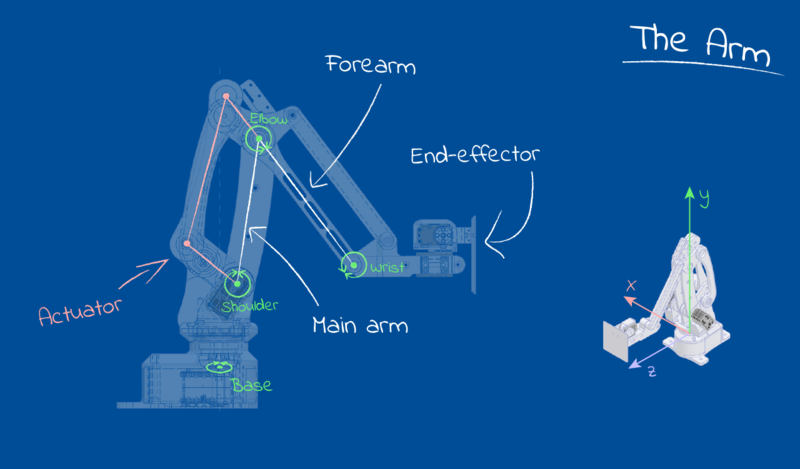 The GIFs below show the different types of movement: the entire arm can swivel on its base, the “main arm” translates the elbow in and out from the centre, and the “actuator” drives the forearm, which in turn translates the end-effector up and down. A 3-DOF arm like this has the handy property of having a unique solution for each possible position of its end-effector, which made the IK task approachable to someone like me, who’s never done this type of thing before. 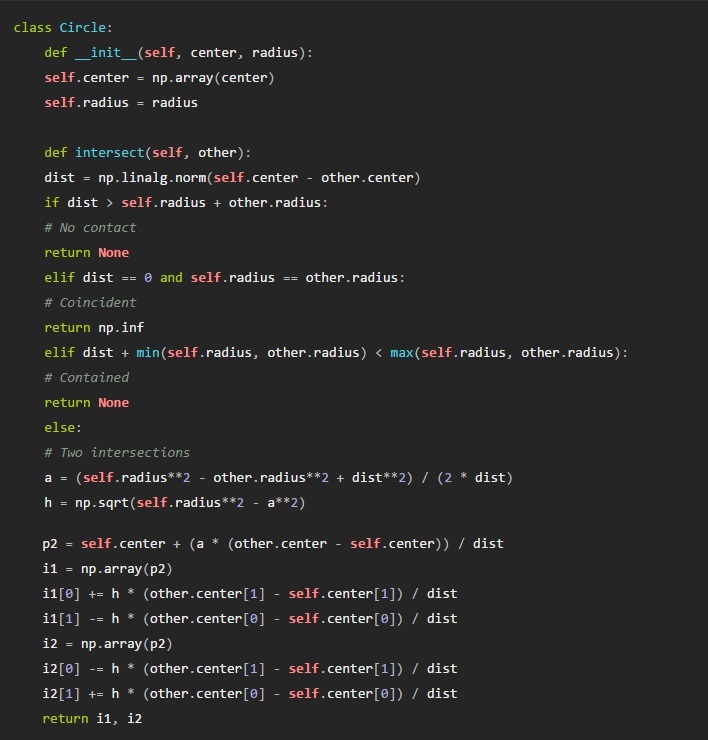 Heads up: The code in this post is written in Python with Numpy, and there’s maths. I won’t pretend that any of the ideas presented here are optimal (or good, for that matter), but hopefully you’ll be able to scrounge something useful! Using the naive trigonometric approach here results in pointing off to the left of the actual goal (right if the shoulder sits on the other side), and the gap is big enough that this is a real problem. I took a shot at solving this geometrically, but quickly decided it wasn’t worth my time figuring it out. In the end, I resorted to an extremely simple numerical technique called a binary search. I’ve used this in the past for other tough geometric problems, like finding an intersection between a Bezier curve and a circle. If A points clockwise of B then np.dot(A, perp) will be positive, and vice-versa. Note that the normalize() function simply sets a vector’s length to 1, while keeping it pointed in the same direction. Mathematically, it’s just doing: A=|A|-1 (np.clip() just keeps the dot product between 1 and -1). With that, we can now perform our binary search and find a decent approximation to the target angle. We need a reasonable starting point, so let’s just use the angle from the origin to the goal (the naive approach I mentioned above). Numpy provides a very useful function for finding the angle np.arctan2(y, x) which resolves the arc-tangent of in the correct quadrant. Now, it’s important to check which side the shoulder sits on: this lets us decide whether to use start_theta as an upper or lower bound. This is as simple as testing the signed angle between the shoulder offset vector (from the origin) and a vector pointing straight forwards. At the same time, we can also establish the other bound by taking the absolute value of this angle and adding or subtracting it from start_theta, since this angle to the shoulder is always going to be greater than the error of start_theta. With our initial bounds established, the actual search loop is pretty straightforward. Note the use of an iteration counter: it’s only there in case something goes wrong (e.g. if we input an unsolvable configuration), since in normal operation the loop exits once the desired accuracy is reached. 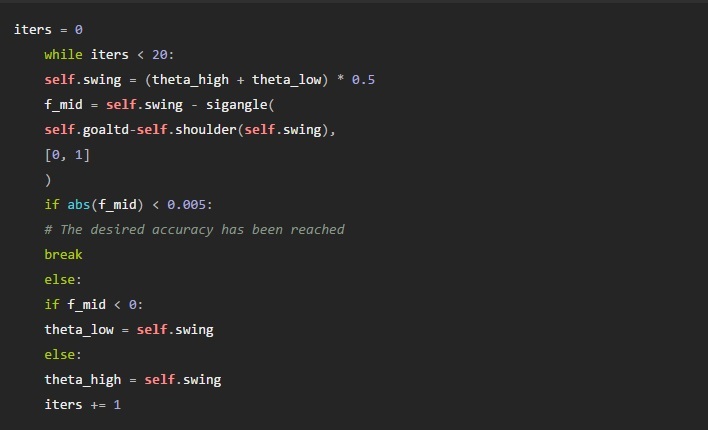 We iteratively update self.swing, which will hold the new target swing angle at the end of the search. 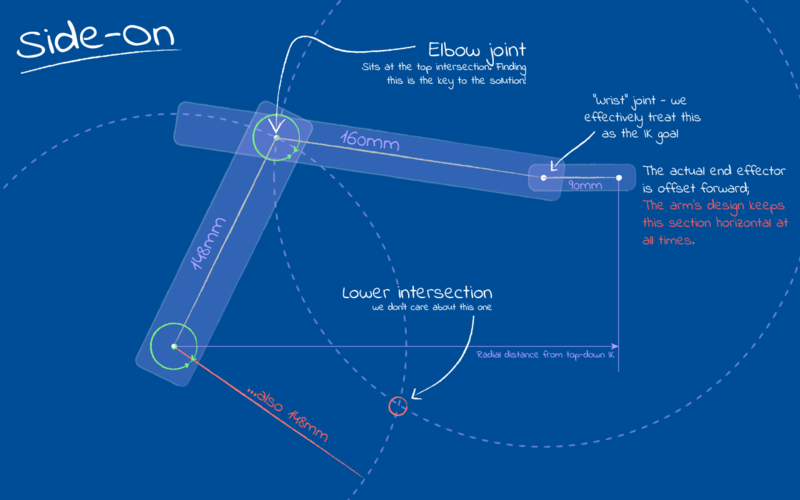 We know which way to point: now, let’s consider the movement of the arm in its ‘plane of operation’, which covers the goal end-effector position and the line extending vertically (+y) from the shoulder joint. The main arm and forearm both move across this plane. The trick here is that we’ll still be using a 2D coordinate system, basically a local frame of reference, where our y value remains the same but the x value is the radial distance of the point we’re interested in. 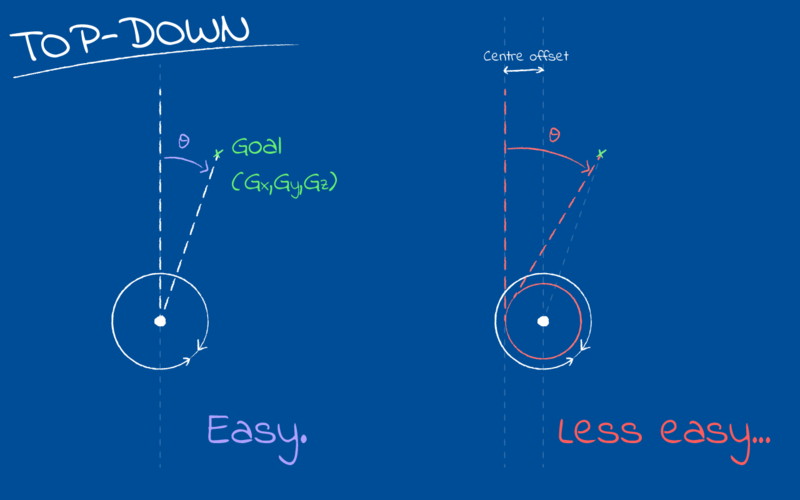 For the goal, we computed this radial distance above in the top-down IK, so we can go ahead and construct goalpl – the ‘planar’ goal – which lies at: goalpl=(goal_radial/goaly).